It’s back to school time!! Although I can hardly believe that summer has come to a close, I always get excited for a new school year. The first few days (and even weeks) are often spent establishing and explaining rules and routines. And while sometimes I’m super eager to get to the curriculum, I know just how valuable taking the time to train the kids is! You can read more about it HERE. Our Morning Calendar Routine is definitely one of the areas I spend plenty of time establishing expectations and routines. Part of the calendar routine involves taking a weather observation for the day. We just use this simple weather chart. Some years I have used it with the rotating cover and brad. Other years I have just laminated it, glued a magnet on the back (for the magnetic whiteboard), and clipped on a clothespin (with a magnet too). Grab it for FREE at the bottom of this post. And since we’re talking about weather, I introduce the seasons toward the beginning of the year as well. 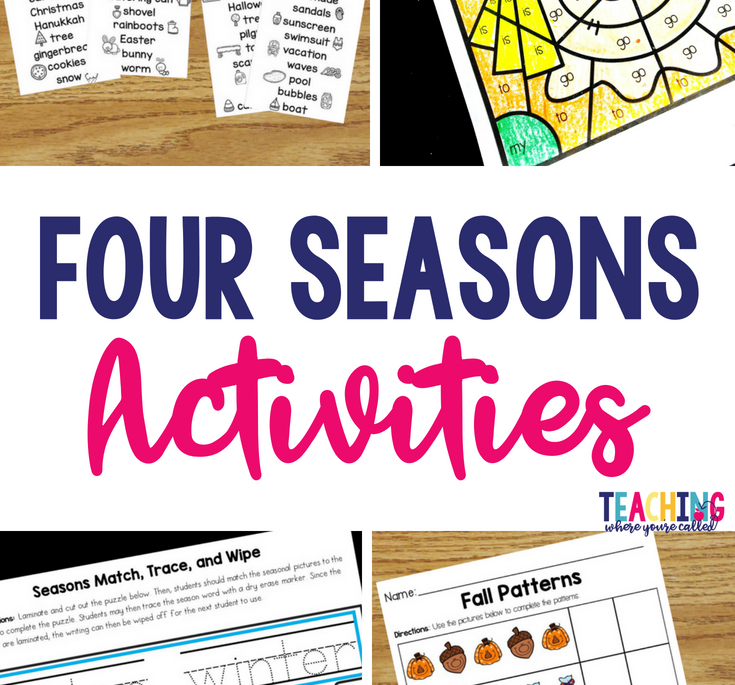 I’m going to be sharing some of the activities from my Four Seasons Activity Pack below. One of my favorite way to introduce the seasons is using the book Tap the Magic Tree by Christie Matheson. Although it doesn’t explicitly name the different seasons, it illustrates the cyclical nature of the seasons through the changes we see in a tree. It’s super interactive and great for prek and kindergarten students. They just love following the various “commands” to make the tree change. 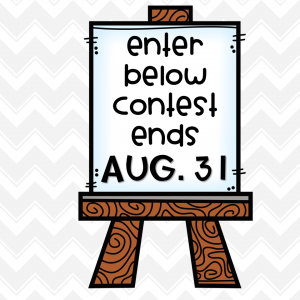 Click on the image below to grab it (This is an affiliate link – which means you’re not charged anything extra, but Amazon gives me a commission for directing you there. You can read my full disclosure policy here). After spending some time interacting with this book, we name the seasons, and then identify which pictures relate to the different seasons. After an introduction to the seasons, we do a class picture sort. Students have an individual sort as well. 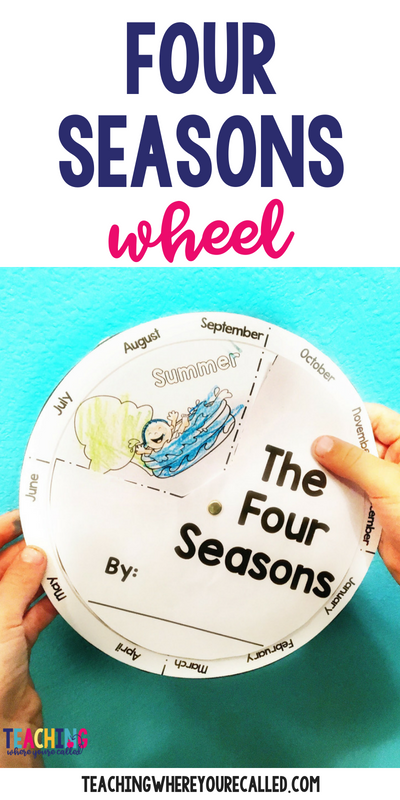 The kids also love building their Four Seasons wheel to color and take home. One of the centers the students love is the four seasons puzzles. There is a puzzle for each season (I usually have 2 copies of each season at the center). 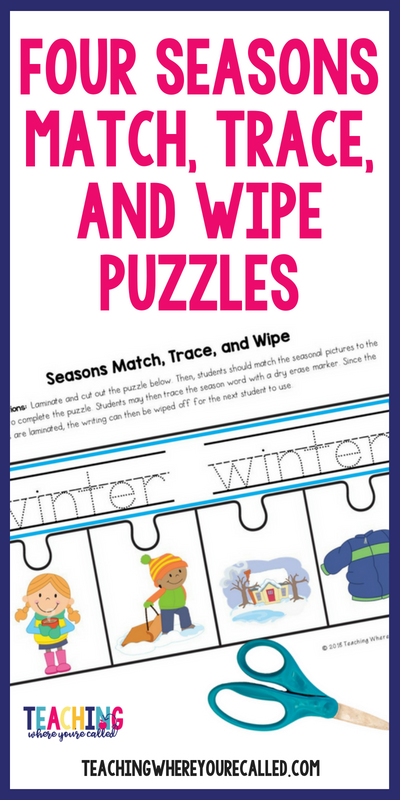 Students find the four puzzle pieces that match the season to complete the puzzle. Then, since the pieces are laminated, students trace the name of the season words using a dry erase marker. Since it’s the beginning of the year, we also spend time creating a class birthday chart. 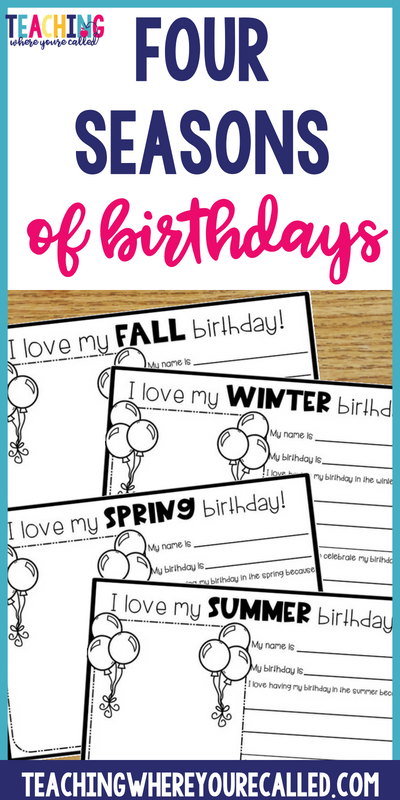 This pairs perfectly with the I Love my _____ Birthday page, where students write a little about what they like about the season in which their birthday falls. We’ve haven’t done a lot of writing at this point in the year, so sometimes I just record what the student shares with me. It’s a great way to get students thinking about the seasons – since they usually can recall events surrounding their birthday! And speaking of writing, one of the things I love most about this Seasons Activity Pack is the Seasons Word Lists. Although I encourage students to use phonetic spelling as much as possible at this point, there are definitely students who want to know how to spell every word correctly. 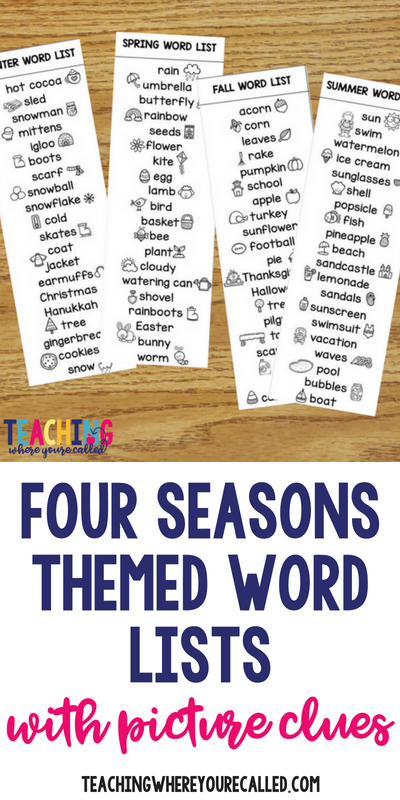 Providing them with these Seasonal Word Lists, not only gives them a little inspiration for their writing, but each list has 20 commonly used words associated with that season – with picture clues!! It’s been a wonderful resource that we use all year! 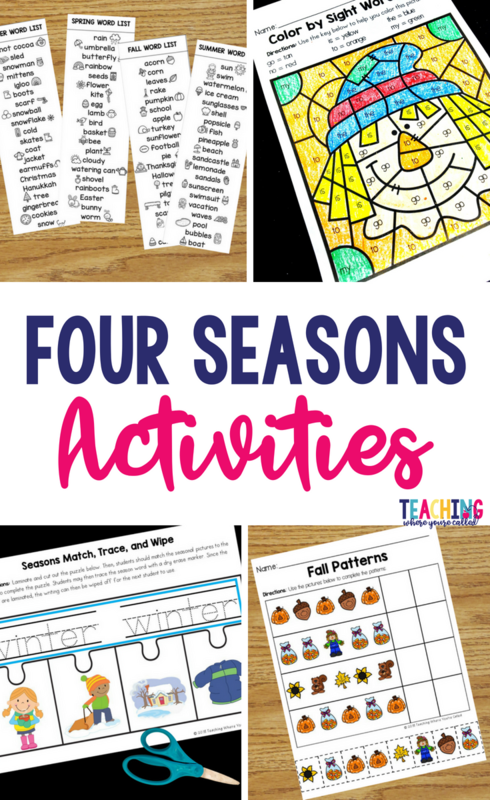 While we spend time at the beginning of the year introducing and discussing the seasons, we revisit the seasons throughout the year as they change. 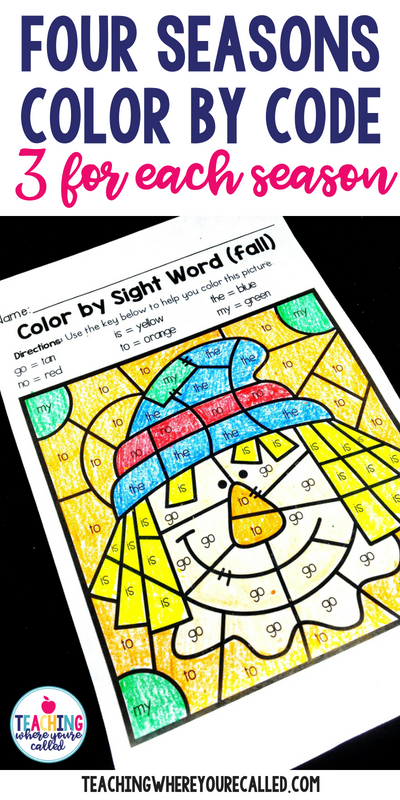 The Seasons Through my 5 Senses, Color by Code Activities, and Emergent Readers are perfect activities to use throughout the year. And since my students tend to know more about technology every year, they absolutely jump at the opportunity to use it when we’re learning about the seasons. 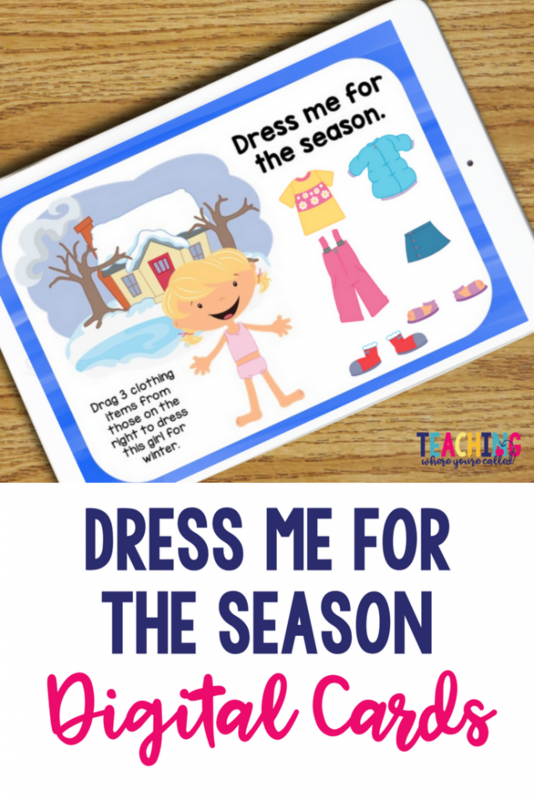 The Dress for the Weather digital cards, as well as the Which One Doesn’t Belong digital cards are always a big hit! 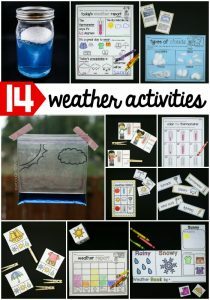 If you’re interested in grabbing these activities for your class, you can find the Activity Pack by clicking on any of the images above or RIGHT HERE. Hope you have the opportunity to check it out! And if you use any of these materials in your class – I’d love to see them in action!! 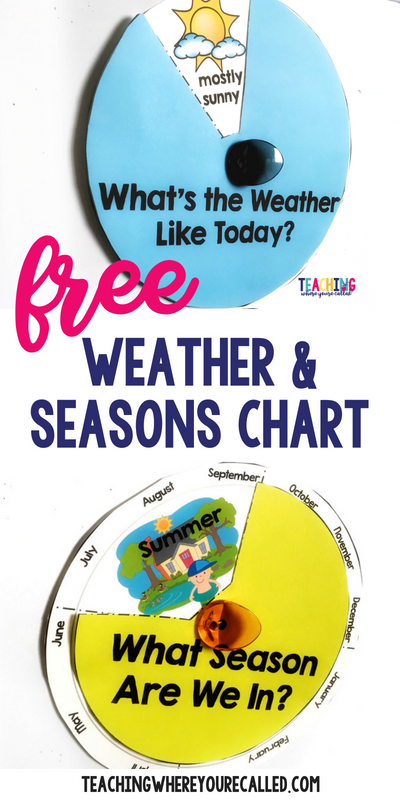 Grab your FREE Weather and Season Chart Download HERE. If you’re interested in more activities about weather, be sure to check out Malia’s Weather Activities in the Playdough to Plato shop by clicking on the image below. *This is an affiliate link, which means that while it won’t cost you anything extra, I will get a commission for pointing you there. However, I use and love her products, and would only recommend them if I believed in them! When I was growing up, we never spent time in the classroom working on a STEM project. In fact, really the only time we referred to “stem” in school was in regard to our study of plants. However, as I got closer to earning my degree and credential, the term STEM was beginning to become a hot topic. And now, the term STEM – and most recently the term STEAM – are becoming increasing popular AND powerful in classrooms across the country. So, what exactly is it? 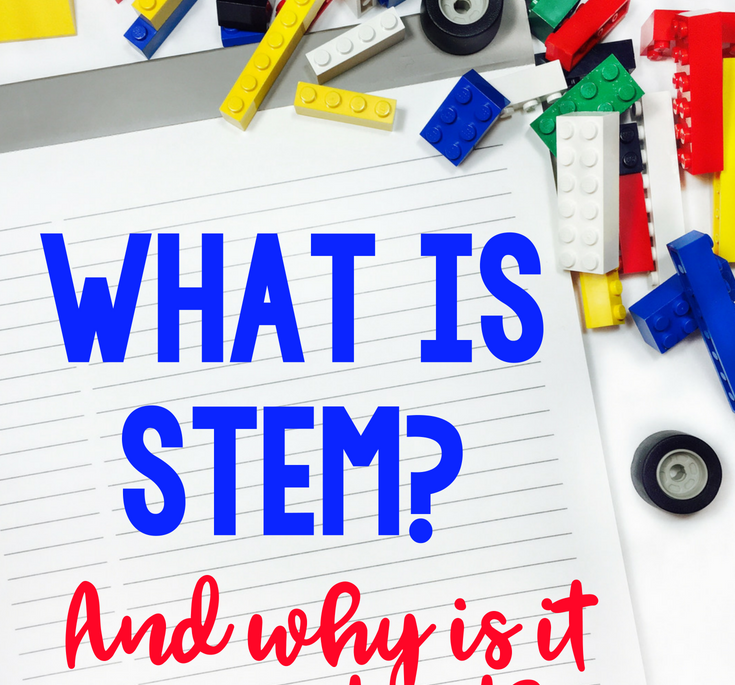 STEM (which we started seeing in the early 2000s), stands for Science, Technology, Engineering, and Mathematics. And in recent years, there has been a big push to include an A in this acronym – intended to incorporate art and design – creating what educators refer to as STEAM. The goal of a STEAM approach is to create a learning environment where students integrate science, technology, engineering, art, and mathematics to solve real problems. STEM/STEAM challenges often ask students to work together to ask relevant questions, brainstorm solutions, communicate about potential problems, seek out information, and apply this information to create a solution. Does it need to incorporate all of the listed disciples to be a STEM activity? No! Remember, the goal of STEM/STEAM is to encourage students to be innovative problem solvers through a variety of opportunities. Who would benefit from STEM/STEAM activities? Whether you’re teaching in a traditional classroom, homeschooling kids at home, or working with kids through tutoring, camps, or other programs, every child can benefit from STEM. And one of the things that I absolutely love about STEM/STEAM is that it appeals to different learning styles and natural abilities. A student that might struggle in reading, may be the one who is able to come up with 3 different solutions for a STEM challenge. Obviously, what I would present to a kindergartner would be much different than what I would present to a 5th grader, but the sooner we can teach kids to think creatively, the better! The bottom line is, STEM and STEAM activities encourage students to be creative problem solvers – and why wouldn’t we want to develop this in our kids? 25 years ago, the thought of people literally being able to carry a computer around in their pocket and be able to connect with other around the world seemed unfathomable. Even when I was in high school and technology was starting to change rapidly, I had no idea just how quickly the advancements would come! Suffice it to say, our modern world is highly driven by the components of STEAM, and we need to develop learners that keep asking hard questions, developing creative solutions, formulating plans, doing research, and applying it to real world problems. STEAM not only exposes children to these learning experiences, but it helps them to develop an innovative mindset that we hope they will carry with them into adulthood. 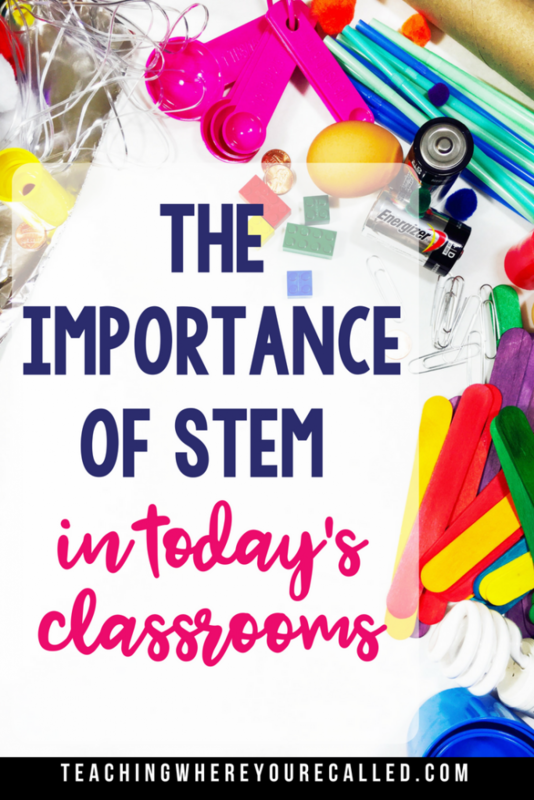 Since we’re working with acronyms, I’m going to use that sane acronym to give you my top 5 reasons for including STEM/STEAM learning opportunities in your classroom. STEM/STEAM is FUN! 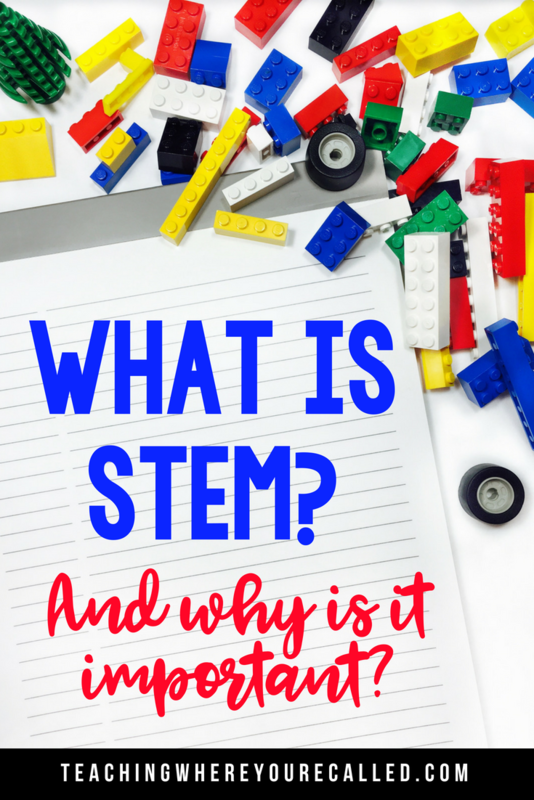 Kids are naturally curious, and STEM activities are definitely driven by that! It encourages students to question, explore, and wonder about the world around them – and it’s hands-on! As a teacher and a mom, I have seen my kids fall in love with STEAM activities! The majority of STEM/STEAM projects involve students working together in pairs or teams to come up with a solution to a problem. Not only does this foster an environment where kids learn to work together, it also teaches them the value of listening to and learning from the ideas of others. Watching students work together (and celebrate together) is such a delight. One of the most valuable components of a STEAM challenge (in my opinion) is that it encourages students to come up with creative solutions for problems. Furthermore, there’s not just one way to solve the problem. Different solutions can be suggested, developed, and tested. Students may come up with multiple viable solutions. All the while they are engaged in the learning process and learning from each other. I’m definitely a “recovering-perfectionist.” And looking back, I think that during my school aged years, I definitely placed way too much focus on the outcome (the test score, the grade, the award), rather than the learning process. How I wish I would have understood how much more valuable that process is! I love that STEM is all about the learning process. Yes, the hope is to be able to create a solution to a problem, but the end goal is not what it’s all about! We’re much more concerned with the questioning, innovation, and critical thinking that’s involved in the learning process! As I alluded to above, STEM/STEAM activities focus on an integrated approach to learning, and often tap into students’ strengths, experiences, and even learning styles that may not otherwise be shared. I have seen students that tend to be reserved or hesitant in other subject areas absolutely “shine” during STEAM time. 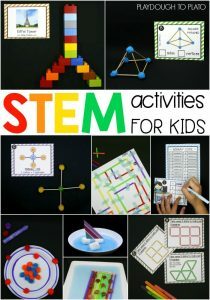 Are you ready to give STEM/STEAM with your kids (or are you just looking for more great STEAM resources)? 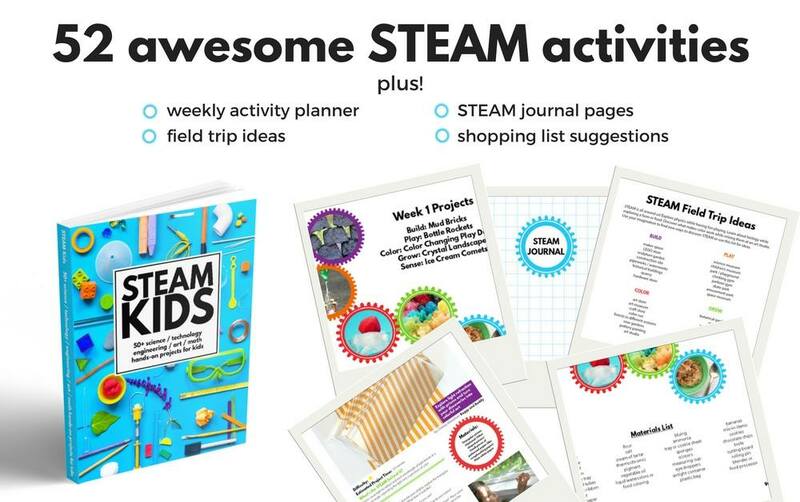 Be sure to check out these incredible STEAM Resources! **Note: These are affiliate links, so while it doesn’t cost you anything, I will receive a commission for pointing you there. Just wanted to let you know! Looking for some FREE STEM Activities for your little learners who are obsessed with dinosaurs? 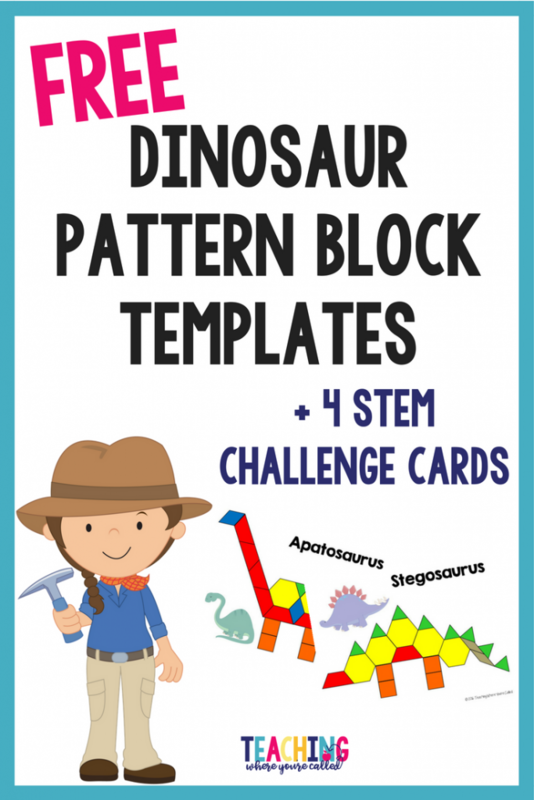 Be sure to grab these FREE Dinosaur pattern block templates and STEM Challenge Cards below! Back to school time is an incredibly exciting – and yet sometimes completely overwhelming – time. If you’re in the states, like me, summer is a time to relax, recharge, and…..start preparing for the next school year! Yes, it seems like the school year hasn’t even finished and I already have ideas for things I want to revise or implement for the coming year. Can I really teach these skills well? Will I be able to lay a foundation that they’ll be able to build upon in the coming years? Do I even know how to teach this well? And when it comes to teaching reading, these thoughts especially loom in my mind. 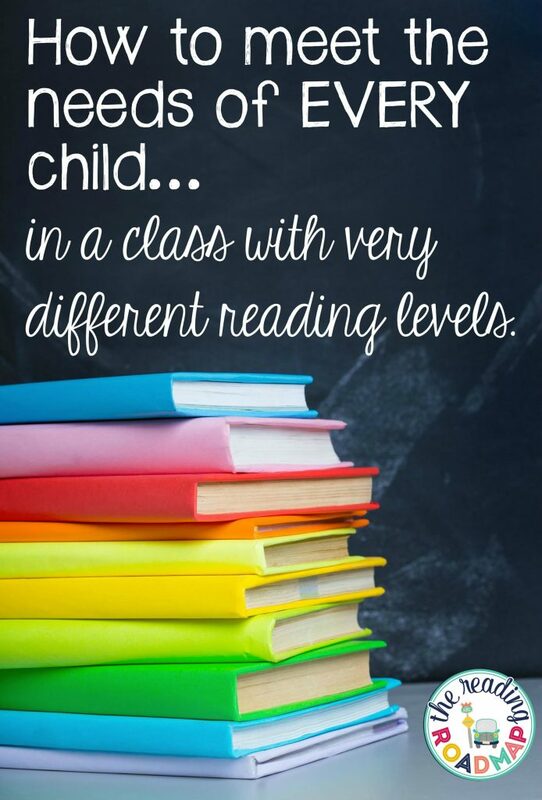 Not only do I want my kiddos to have the skills to be able to read well, but I also want them to LOVE reading. I want them to fall in love with books and not constantly feel frustrated because it’s not clicking. 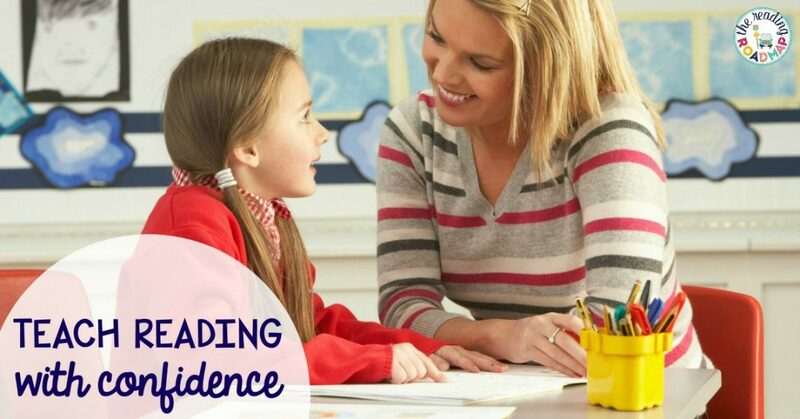 If you are a preschool, kindergarten, 1st grade teacher, or a homeschool momma, you know that you have the incredible privilege and responsibility of building your students’ reading foundation. Maybe you’ve felt the pressure that I have. 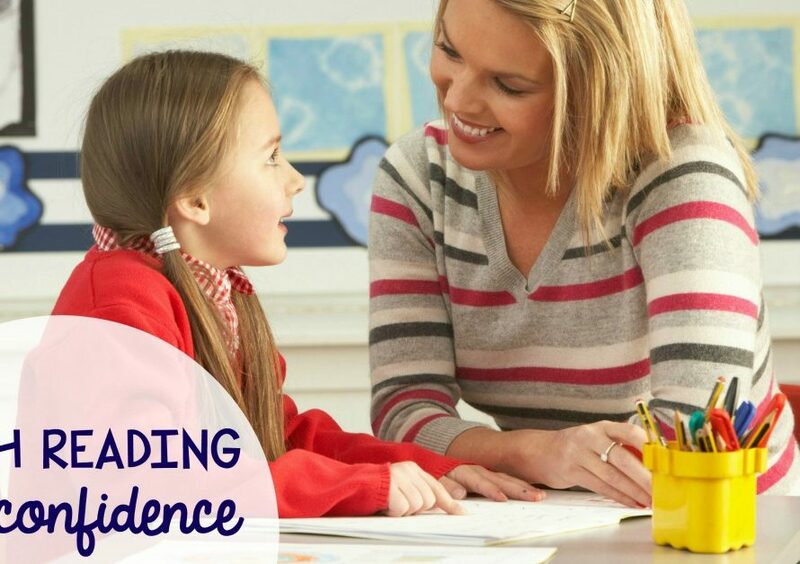 And if you’re in the classroom, you have the added pressure of trying to meet the needs of all your students – even when they can be at such diverse reading levels! And it can be overwhelming to say the least! And perhaps you’d really just love to have someone in your court, assuring you that you’re on the right track and helping you with the necessary tools to do this incredibly important job well! I’ve got the perfect person (and team) for you! 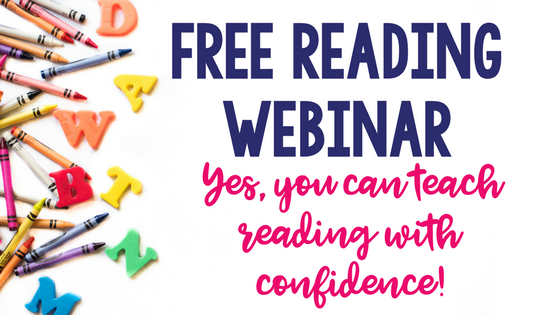 I’ve joined the Reading Roadmap Team with Malia, from Playdough to Plato, and am super excited to share with you this FREE webinar training to help you teach your children to read with confidence! Yes, you heard that correctly! It’s totally FREE!! 5 common mistakes and how to avoid them. But you have to reserve your spot today!! 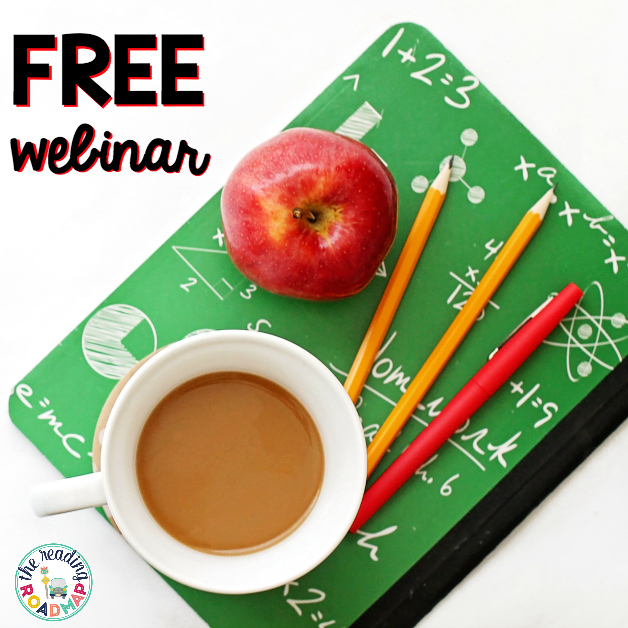 Just click on the box below to sign up for my affiliate webinar link! But you have to sign up now to get access to this amazing training! And seriously, it’s free! What could be better?!?!? And let me just tell you, this course is AMAZING! I have used so many of the ideas that she shares and it has revolutionized my reading instruction! Be sure to check it out!! Make sure you sign up today! Can’t wait to see you there! My kids and I looooove using dot markers! Not only do they help kids with their fine motor skills and hand-eye coordination, but there is really no clean-up for Mom! Yep – no paintbrushes, no water cups, no paint pallets – it’s simply the dot markers and the paper. Seriously, it can’t get much easier than that when it comes to art! I love that the dot markers can be used for skill-focused activities as well as free creative expression. The boys love the bright colors and the ease of use – and that they last for so long! There are so many educational and fun ways to use these and I wanted to share a few of my favorites today! 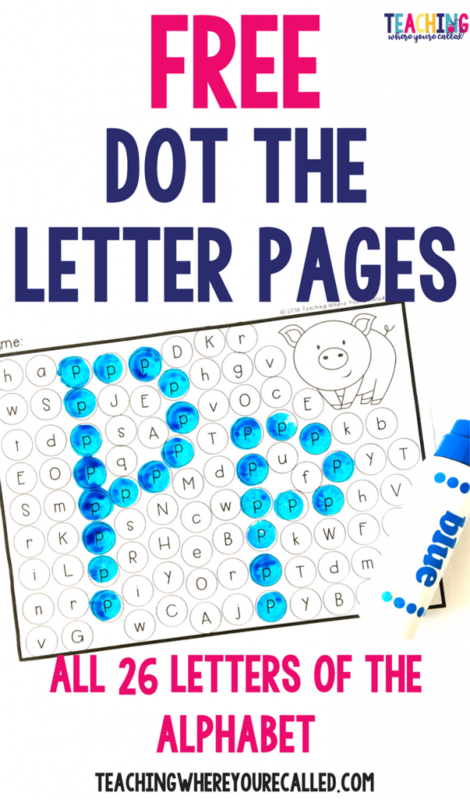 When my boys first began working on letter recognition, they absolutely loved getting to “dot” the letter on the page. 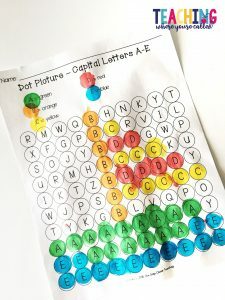 Because using the dot markers made the task so simple, they were really able to focus on the letter recognition skill and have fun in the process. Since this was an activity they asked for repeatedly, I’ve made my A-Z Dot Pictures available for FREE below! Just click on the picture to grab your FREE set! Again, the simplicity of use makes these a perfect tool to use when teaching patterns. Since there’s no cutting or gluing this is a great way to practice simple patterns, especially when you’re short on time! 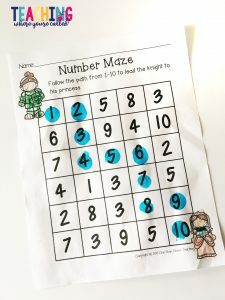 This works similar to the letter and number recognition, except with this activity you can work on distinguishing between different numbers, letters, and even sight words. Kids love to take surveys of neighbors, friends, classmates, and family members, which can then be translated to a graph. However, keeping the graphs accurate can get a little tricky for little guys. Using dot markers can really help with this – especially if you use a different color for each option. My kiddos have always been thrilled with the results! Both of my boys love doing arts and crafts projects, but I am not a super crafty person. But using dot markers for tape-resist art projects have given us some pretty great results. You simply tape off the part that you want to keep white, and then the kids can just go crazy filling in the rest of the space with the dot markers. We usually keep it simple by doing a simple shape with the tape, but I have seen others actually tape the outside of the project so that the kids are actually filling in the shape with the dot markers (kind of like a stencil). 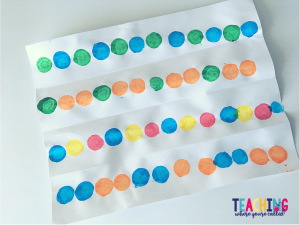 I’ve already mentioned how we have used dot markers to identify letters, numbers, and sight words, but this option allows your students to practice putting these elements in order. For example, you might have a maze where students have to follow the alphabet A-Z. Or perhaps they’re following counting numbers from 1-20. We’ve even used this type of activity in practicing spelling our names. Using dot markers not only makes it easy for them to fill the space for the maze, but it also makes the path at the end very clear. Dot markers are so easy to use, my kids love them for just creating pictures of their own. They come up with some of the most creative ideas. 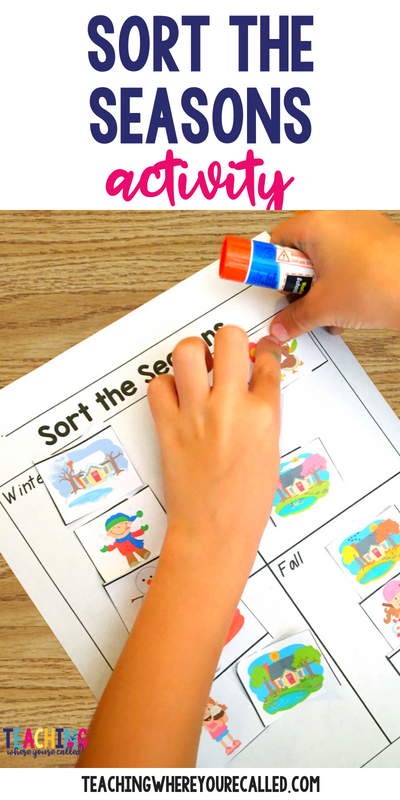 And if you want to work on fine motor skills while still letting your kids get creative, there are a number of printables that have adorable graphics with space for kids to “dot” in the pictures. This allows them to be creative while still focusing on being accurate with the dot markers. 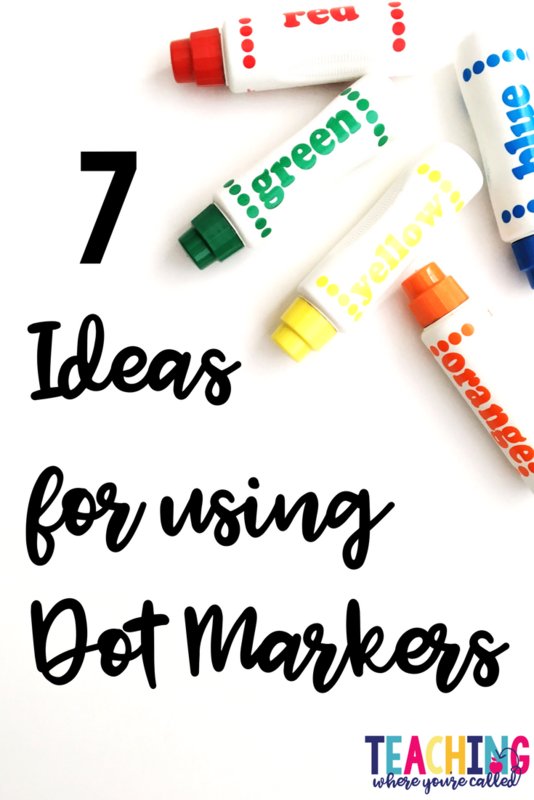 We absolutely love using dot markers, and I hope this post gives you a few new ideas on how you might be able to incorporate this wonderful tool in your learning. Do you have other ways that you love to use dot markers?! Leave me a note in the comments – I’d love to hear about it! 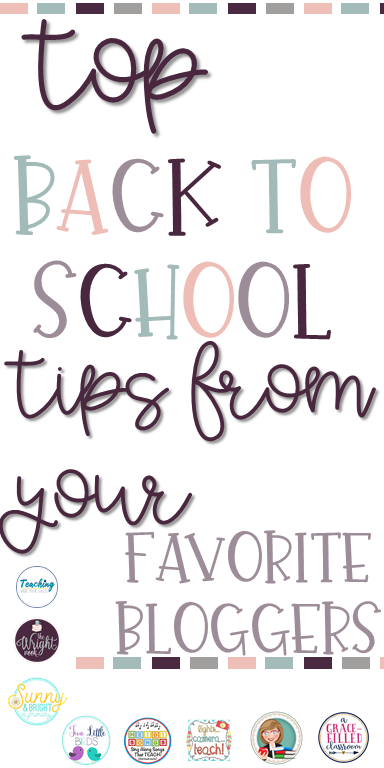 I’m so excited that you’re joining us for this Back to School Tips Blog Hop! 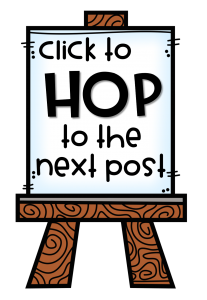 Since I know you’re hopping through several blogs, I’ll try to make mine short and sweet! My tip is a little unconventional in that it doesn’t have anything to do with classroom management, classroom organization, parent communication, or anything like that. This tip is all about you – and creating a routine that helps you keep your sanity throughout the whole year so that you can keep up with all those other things – and you kids too! I know that when the back to school season hits, it’s easy to try and just power through the day – doing everything in your power to simply make a dent in your mile-long to-do list. The list of things you need to get done seems to be being added to faster than you can check items off, and the absolute last thing you think you can do is take a break for yourself. But I’ve learned that this often leaves you more overwhelmed and exhausted than if you had taken some time to recharge. But building this into my regular routine has made such an incredible difference. Not only does the regular exercise help me to keep up with the boundless energy of these little ones, but it’s an incredible stress-reliever and I think I get some of my best ideas when I’m in the middle of a run or pushing it on the elliptical at the gym. In short, my tip is to take some time at least 4 days a week to carve out some time for some exercise, healthy meal planning, and simple downtime (no, I don’t mean sitting and grading papers!) You will truly be amazed at how much this change can affect your entire school year! I know it’s hard – but I also know it’s worth it! 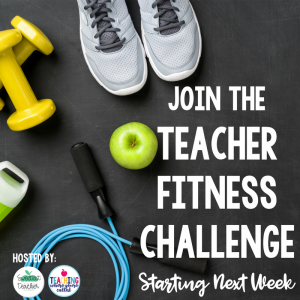 And this year I have teamed up with my friend Kayla from Sweetest Teacher to host the Teacher Fitness Challenge on Instagram. Each week we share a different challenge related to exercise, nutrition, or hydration – and we try to get as many teachers on board as possible! It has been so fun seeing how different teachers have been using these challenges for motivation – and to get their peers in on the action! We’d love to have you join us! Just follow us on Instagram for all the latest challenges! Now, if you’re looking for tips for classroom management, you can check out my 7 Tips for Successful Classroom Management HERE. Welcome! 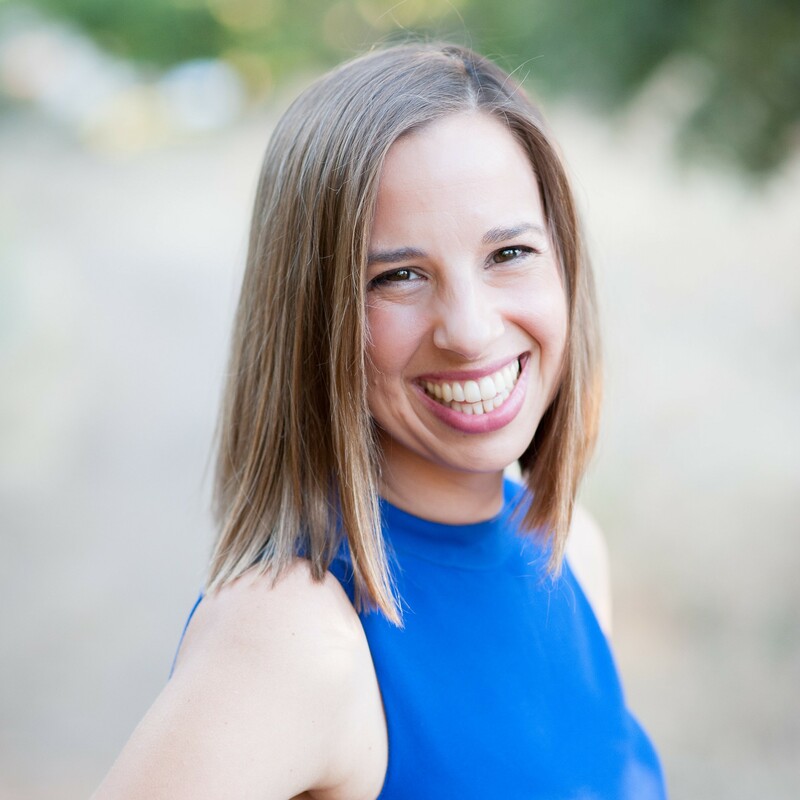 Hi, I'm Ashley, an elementary teacher turned homeschool momma, who know just how important (and exhausting) those roles can be! And that's why I'm so glad you're here!To hear a little more about me, click on over to my about page.